On February 23rd, Citizens for Bengaluru (CfB), an independent citizens group, posted on its Facebook page about the struggle of women garment workers to get access to public transportation. “A thousand women (may be a 100 men?) stream out of the factory. Not all at once. But in bunches. They are on a mission. To make that purchase. 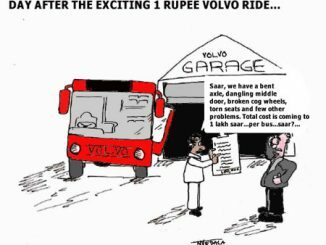 To get on that bus or tempo (which is 3 times cheaper than BMTC). To get home. To start working, again, at home. After 9 hours of work at the garment factory,” the FB post read. The CfB post explained how thousands of garment workers on Mysore Road, beyond Kengeri were opting for private buses or tempos over BMTC buses, because they are three times cheaper than BMTC. Of their monthly salary of Rs 7,000 these women garment workers could not afford to pay Rs 1,050 for monthly BMTC bus pass. This triggered CfB and BMTC Bus Prayanikara Vedike (BBPV) to launch a campaign demanding the BMTC to reduce the fare and add more buses to its fleet. Soon the citizens launched Bus Bega Bhagya Beku campaign, to demand the State government to set aside more funds for BMTC in the coming budget. A press meet was called, publicity was given, and the citizens group also met Transportation Minister Ramalinga Reddy a day before launching of the campaign. Citizens for Bengaluru and BMTC Bus Prayanikara Vedike volunteers meeting Transport Minister Ramalinga Reddy. Pic courtesy: Srinivas Alavilli. The result was Bus Bhagya Beku Day organised at Shanti Nagar TTMC on Saturday, March 4th. In response to the call from Citizens for Bengaluru (CfB) and BBPV, hundreds of citizens took the bus on Saturday, on Bus Day celebrated as Bus Bhagya Day. The campaign was to raise awareness for the two demands to the Chief Minister to allocate funds to BMTC in the upcoming budget to halve the fares, and double the buses. When the crowd gathered at Shanti Nagar, both the BMTC Chairman and MD came down to listen to the protesters and addressed the gathering. Stressing on the need to have more buses in the city, Tara Krishnaswamy of CfB said, Bengaluru citizens have claimed their rightful voice prior to the Karnataka state budget. The people’s demand is to address the every day is traffic issue by allocating funds for #BusBhagyaBeku. This will allow the city to move one step closer to being more sustainable, livable and affordable by investing in mass transit. Hinting at intensifying the fight for more buses, Vinay Sreenivasa of BBPV said that the citizen groups will intensify their demand in the coming days so the right decision is taken. We are spending thousands of crores for Metro but not the same investment is made on BMTC. Parents brought kids, distinguished senior citizens Bhargavi Narayan, theatre personality Gowri Dattu, Vasanthi Hariprakash, musicians Bruce Lee Mani, Ashwin Sharma, Kannada actor Shraddha Srinath boarded buses from various depots and encouraged people to join them in the movement. Campaigners sent a strong message to people to use buses for their transportation and it contributes towards environment protection. There was a festive atmosphere at Shanti Nagar bus station. Citizen activists like Kathyayani Chamraj, Leo Saldanha, Kshitij Urs, Lingaraj Urs, Prakash Belawadi, Naresh Narasimhan and many others joined the campaign along with garment workers, street vendors and members of construction workers association. Sadhana Mahila Sangha, Bengaluru Jilla Beedhi Vyaapaari Sanghatanegala Okkuta, BBMP Guttige Pourakarmikara Sangha, Sangama, Slum Janandolana Karnataka, Karnataka Slum Janara Sanghatane, Garment and Textile Workers Union, Action Aid, People’s Union for Civil Liberties – Bangalore, Vimochana, Alternative Law Forum, Bruhat Bengaluru Gruha Karmikara Sangha, Munnade, CiFOS, MSI, Karnataka Pragatipara Kattada Karmikara Sanghatane, Karmikara Munnade, Payana, EQUATIONS, Green Bangalore Campaign, Forum for Urban Commons and Governance, and independent activists Shakun Doundiyakhed and Bhuvana Balaji, Luncha Mukjta Karnataka Nirvana Vedike, Nagarika Vedike, BMTC Staff Union, Maraa and Karnataka Janaarogya Chaluvali. “BMTC will add 3,000 more buses to its fleet and they would be a mix of ordinary and AC buses. As far as fare reduction is concerned, the fare will be reduced only for the 2nd stage from Rs 12 to Rs 10,” the Chairman said. He assured the campaigners that he would request the government for more financial support to BMTC. BMTC Managing Director Ekroop Caur addressed the media and said that she agrees that there needs to be more buses and hence they have asked the government to sanction 3,000 additional buses. “The state government does support BMTC to offer some subsidies. If we get more support from the government, we can reduce the fares further,” the MD said. With inputs from Srinivas Alavilli, a volunteer with the Citizens for Bengaluru group. 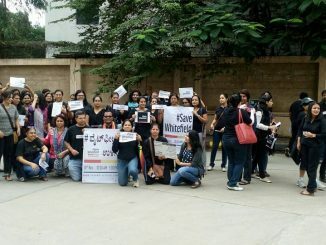 A Whitefielder shares her observations from the #SaveWhitefield protest. It’s high time citizens’ voices are heard, she says. A disputed decision to award a contract and years of litigation have come in the way of decent housing for the low-income residents at Ejipura. The rainy season has made lives miserable here.